The sixth wild camp, the MLD Trailstar stands up to a beating! Having had a successful wild camp in the Trailstar it was time to test it out in different conditions. This time there was three of us, my brother Pete wanted to experience wild camping in the Peaks. 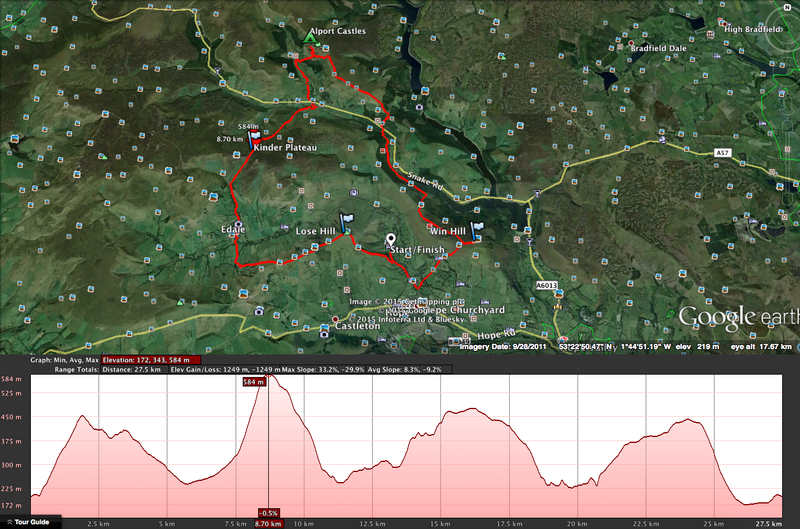 The route started from a B&B carpark (permission kindly granted) on the Edale Road climbing steeply to Lose Hill. Following Back Tor to Hollins Cross and into Edale. Weather was sunny, very windy and the occasional hail/snow flurry. Continuing through Edale we took the Golden Clough route up to Ringing Roger, the whether turned for the worse at this point. The sky went black and rain/sleet/hail followed for the duration of the Kinder Plateau crossing. Reaching Blackden Edge we dropped down to Alport Bridge and through the Alport Dale turning right at Alport Castles Farm. After a short but fairly steep climb up to Alport Castles below The Tower we pitched tents/tarps for the night. Alpert Castles is a over half a mile long landslip that is the largest in the UK. The night was cold and windy, not unexpected. The valley funnels wind down the from Bleaklow directing most of it into Alport Castles. Despite the heavy winds the Trailstar didn’t show any signs of stress. The next morning took us up to the top of Alport Casltes and along to Rowlee Pasture, Hagg Farm and over the River Ashop. Following the Ladybower reservoir for a short time before heading up to Wooler Knoll and along to Win Hill. The final decent was then back into Hope for a well deserved pint!! For more route info see the Wild Camp map page. A highly recommended route that covers my favourite parts of the Dark Peak, not an easy one but well worth it. 2. Don’t lend all you warm winter gear to your brother leaving you with just cold lightweight summer gear!